Since the 1969 Santa Barbara spill, scientists have found that natural California oil seeps leak tons of petroleum each day. After drilling 3,500 below the Pacific Ocean floor, a Union Oil Company drilling platform six miles off Santa Barbara suffered a blowout. The accident spilled up to 100,000 barrels of oil into the ocean with some reaching southern California’s beaches, including Summerland – where the U.S. offshore petroleum history began in 1896 with wells drilled from piers. “Riggers began to retrieve the pipe in order to replace a drill bit when the mud used to maintain pressure became dangerously low. A natural gas blowout occurred,” explains a report by the University of California, Santa Barbara. The well, which was controlled after 12 days, turned public opinion against offshore exploration and helped lead to establishment of the Environmental Protection Agency in December 1970. Scientists have reported that natural California oil seeps leak up to 25 tons of oil every day – and have done so for thousands of years. Offshore wells actually reduce natural seepage by relieving reservoir pressure. The Santa Barbara Channel remains among the largest seeps in the world; most scientists agree that seepage in the channel has been significantly reduced by oil production. A new energy education exhibit at the Santa Barbara Maritime Museum, a “History of Oil in the Santa Barbara Channel,” opened in September 2018. Parker Rig No. 114 has welcomed visitors to Elk City, Oklahoma, since 1991. Among the biggest drilling rigs in the world, Parker Drilling Rig No. 114, was erected in a vacant lot in downtown Elk City, Oklahoma, after the chamber of commerce realized that the reassembled rig, visible from both Interstate 40 and historic Route 66, would draw tourists into town, noted NewsOK in 1991. The Parker rig once drilled wide, deep wells for testing nuclear bombs. In 1969, Parker Drilling signed a contract with the U.S. Atomic Energy Commission to drill a series of holes up to 120 inches in diameter and 6,500 feet deep in Alaska and Nevada for the tests. The company later modified the Atomic Energy Commission rig to drill conventional wells, several of which set records by reaching beyond four miles deep into the Anadarko Basin. The 17-story Parker No. 114 today stands in downtown Elk City next to the former Casa Grande Hotel at the intersection of 3rd Street and Route 66. Casa Grande, which opened in 1928 to lodge the highway’s travelers, was added to the National Register of Historic Places in 1995. It also was once home to a natural history museum that included petroleum exhibits. Karl Benz’s wife Bertha was the first person to drive his gas-powered motorwagen over a long distance – bringing worldwide attention. German mechanical engineer Karl Benz applied for a patent for his Benz Patent Motorwagen – a three-wheeler with a one-cylinder, four-stroke gasoline engine. His “Fahrzeug mit Gasmotorenbetrieb” (vehicle with gas engine operation) patent was the world’s first patent for a practical internal combustion engine powered car. Although there had already been “auto-mobiles” powered by steam or electricity, Benz used the internal combustion engine as the drive system for a “self-mover,” notes a Mercedes Benz historian. “On January 29, 1886, he presented his stroke of genius at the Imperial Patent Office – the car was born.” See First Car, First Road Trip. The first U.S. auto show took place in November 1900 in New York City. America’s highways and travel history are on exhibit at the National Museum of American History’s America on the Move. Oil scouts like Justus McMullen of Bradford, Pennsylvania, braved harsh winters to gather intelligence about oil wells. In the winter of 1888, a famous oil scout died. Thirty-seven-year-old Justus McMullen succumbed to pneumonia contracted while scouting production data from a well near Cannonsburg, Pennsylvania. McMullen, publisher of the trade publication The Petroleum Age, contributed much to America’s early oil industry as an oilfield detective. Called “riders of the hemlock,” these scouts debunked rumors and demystified oil well production reports – sometimes despite armed guards. Learn more in Oil Scouts – Oil Patch Detectives. Founded in 1946, the Petroleum Club of Houston began meeting on the top floor of the Rice Hotel in 1951. Texas independent producers founded the Petroleum Club of Houston. The group began meeting on the top floor of the Rice Hotel in downtown Houston in 1951. The club members hosted countless energy industry events and lunchtime business meetings where deals were made on handshakes alone. The club included a 21-foot-tall tapestry created to represent a geological cross-section of Texas. In 1963, the club moved into the Exxon Mobil Building, where it occupied 45,000 square feet on floors 43 and 44 for more than 50 years before moving into the top floor of the nearby Total Plaza in 2015. Also learn about Dallas Petroleum Club History. For the first time, crude oil price quotations began to be based on specific gravity – the heaviness of a substance compared to that of water. In the new oil regions of Pennsylvania, independent producers frequently met to sell shares of stock, argue prices and enter into refining contracts that depended on the oil’s quality. Before the Titusville Oil Exchange was established in 1871, producers gathered in convenient establishments, such as Titusville’s American Hotel or along Centre Street in Oil City – known as the “Curbside Exchange.” Learn more End of Oil Exchanges. The American Petroleum Institute’s API gravity, adopted in 1921, has become the worldwide standard. Oil is classified as light, medium or heavy, according to its measured gravity. “Ethyl” gasoline goes for the first time at this Dayton, Ohio, gas station. Photo courtesy Kettering/GMI Alumni Foundation. 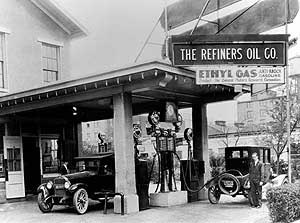 The world’s first anti-knock gasoline containing a tetra-ethyl lead compound went on sale at the Refiners Oil Company service station in Dayton, Ohio. Discovered two years earlier by General Motors scientists, “Ethyl” vastly improved engine performance. GM began offering service stations simple bolt on adapters called “Ethylizers” to meter the proper proportion of the new additive. “By the middle of this summer you will be able to purchase at approximately 30,000 filling stations in various parts of the country, a fluid that will double the efficiency of your automobile, eliminate the troublesome motor knock, and give you 100 percent greater mileage,” Popular Science Monthly reported in 1924. The toxicity of tetra-ethyl lead resulted in its government-mandated phase out beginning in 1976. Learn more about Ethyl Anti-Knock Gas. Next week in petroleum history: The legacy of “Buffalo Bill” Cody extends beyond his Wild West Show and into the early Wyoming oilfields.